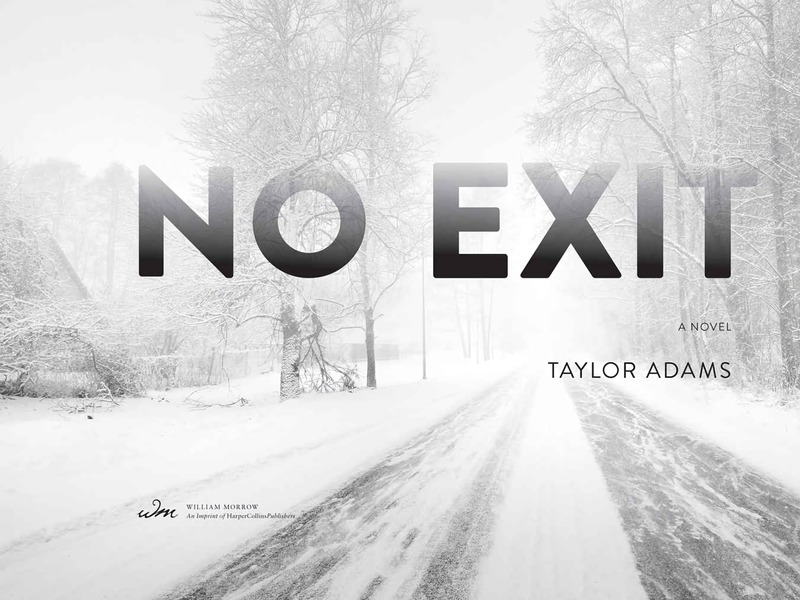 'No Exit' by Taylor Adams Review – AiPT! Rest areas are not the type of places you ever want to spend a lot of time visiting. Every year, I have to take a group of students to Florida, which inevitably results in at least 1-2 stops at one of these interstate oases…which inevitably takes at least 30 minutes and makes me want to lose my mind. Now imagine traveling through Colorado in the dead of winter during a terrible blizzard and getting stuck at a rest stop with four random people. It’s in this particular ring of frozen hell that college student Darby Thorne finds herself while traveling to visit her mother, who is days or possibly even hours away from losing a bout with cancer. As if all this weren’t terrible enough, there’s no cell phone reception (of course) and Darby left her phone charger back in her dorm (of course). Yet all of that awfulness pales in comparison to what she sees in the back seat of one of the snow covered cars when she wanders outside for a bit: A little girl bound and gagged inside of a large cage. It’s with this premise that author Taylor Adams walks us through a night of fear and suspicion that pumps more tension per page than any thriller I’ve read in a very long time–or maybe ever. Let’s dive in and see why this book is worth snagging off the shelf or Amazon (besides getting its ads on your Goodreads page to stop harassing you). I already covered what you need to know about ‘No Exit’ if you want to go in relatively spoiler free. I don’t really want to say much more since a great deal of this book’s effectiveness lies in how it unfolds over the long night Darby spends in the rest stop with the four strangers, at least one of whom is definitely a child kidnapper (or worse). The narrative takes place primarily from Darby’s point of view, although it occasionally jumps to another character (much more so near the end). Adams does a masterful job giving these characters a unique voice while also ensuring that any “head hops” are not only narratively sound, but clearly delineated. Even if you’re a well read cynic who thinks they can spot most plot twists from a mile away (like myself), you’re guaranteed to be caught off guard at least a couple times. There’s nothing supernatural going on here, although the idea of supernatural evil working behind the scenes to facilitate real world psychotic depravity is explored a bit. I know that sounds weird, but trust me when I say that it absolutely works without unfairly affecting the plot or “magic-ing” away any plot points. As much as I enjoy movies like Halloweeen or The Hitcher, the terror Darby must face is not simply a physical embodiment of pure and/or relentless evil. Adams takes us deep inside the history and motivations of what Darby’s up against. Instead of demystifying things, however, this makes her ordeal (and her opponent) even more terrifying. If this book connects with you like it apparently has with most people (myself included), then you are going to have an extremely difficult time putting it down until the last page. Adams is an absolute master at drawing the reader along a tightly wound narrative that ratchets up the tension every hour that Darby is stuck at the rest stop. And speaking of Darby, she is my type of protagonist. She’s definitely full of humanity and heroism, but it’s countered by very real human flaws, including the fear any of us would feel in a situation like this. That fear not only humanizes her, but greatly impacts how things play out. There is a lot about Darby that represents the best in people, but she’s far from the best option the kidnapped little girl could ask for as a savior–and it makes her that much more of a fantastic main character. Page-by-page, hour-by-hour, we witness Darby physically, mentally, and emotionally wear down while her resolve paradoxically (and logically) strengthens. She desperately wishes that someone else could have been in this situation besides her, but she’s also determined to see it through to the end and save the kidnapped girl. As the story behind the girl’s kidnapping unfolds, the added layers make the narrative even more terrifying while also pressing down with near unbearable force on Darby’s spirit. The evil she ends up facing is very real, but that doesn’t make it any less horrifying or seemingly insurmountable. By the time we reach the story’s climax, there is no comfortable narrative trajectory that we can expect. Good, Evil, and Unpredictable Chaos are all on equal footing, squaring off in a snow filled arena where the popcorn comes in a 12 oz. bag that costs $1.25 and won’t take your wrinkled dollar bills. While there isn’t anything supernatural at play in the story, there are a couple of moments where the realism of Darby’s physical limitations get stretched a bit. Nothing superhuman or anything like that, but enough so that you’ll definitely need to suspend your disbelief a bit. And much as I love how the plot plays out (and how carefully seeded/plotted all the twists were), there’s an added layer near the end that felt a little much. It’s still great and believable within the framework of the story, but it also takes some of the luster off the work Adams did to make his tale feel like a product of chaotically horrible chance. Speaking of chaos, there are a few minor aspects of the story’s conclusion–one in particular—that felt a little too neat. No Exit is a beautifully constructed clockwork of tension and fear. Putting any type bow on top of it, however small, just didn’t feel right. And while I’ve come to accept and even embrace cell reception dead zones as a plot device…leaving your charger at home for a road trip? Rookie move, Darby. Normally when I’m reading a book and audibly shout “OH C’MON,” it’s because of something I thought was ridiculously bad. I shouted this phrase multiple times while reading No Exit, but not out of displeasure. Instead, it was because I thought I’d reached a good point to bookmark my progress and get back to work only to have Adams reveal something that yanked me right back to read another chapter. A cliche term like “page turner” doesn’t do this book justice. No Exit is a near perfect confluence of addictively engrossing narrative and fantastically realized characters. Both aspects on their own could have been good enough to carry the other if it were subpar, creating a pleasantly enjoyable reading experience. Instead, No Exit injects the reader with a wonderful mixture of both, producing a tale that absolutely refuses to be forgotten or ignored once it’s been started. Even if the upcoming movie ends up being a masterpiece, you owe it to yourself to read No Exit first. Just make sure you don’t start reading it during a pit stop at an interstate rest area. Before you know it, the sun will have gone down and you’ll be halfway through the book…and you just might be sitting in the lobby with a group of people you’ll wish you’d never met. A near perfect confluence of addictively engrossing narrative and fantastically realized characters creates a truly masterful thrillers that you'll struggle to put down until the page. The narrative continually ratchets up the tension hour-by-hour and page-by-page. Darby is both admirably heroic and tragically flawed. Her humanity easily represents the best of us, but her fear (and occasional cowardice) is uncomfortably relatable. A few of the books physical feats require you to stretch your suspension of disbelief a bit. Some of the story's added layers near the end feel a little much. A few minor aspects of the story's conclusion--one in particular---felt a little too neat.